All Revelation events in one easy-to-use chart! This chart places the events that occur in the book of Revelation in an easy-to-use fold-out chart. You will be able to see how the prophetic events fit into the end-times calendar. Also included are two informative articles by Dr. Jeremiah offering counsel about living for Christ today. 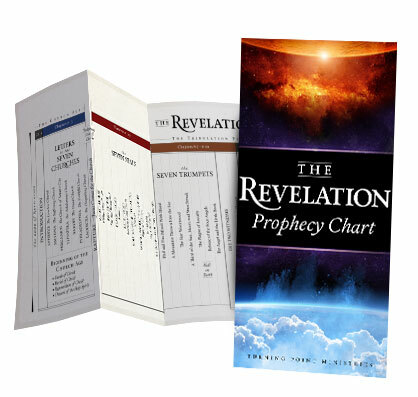 The Revelation Prophecy Chart is available upon request when you contact Turning Point. Where should we send your Prophecy Chart? This resources is free of charge. However, your generous support is greatly appreciated. Click here if you would like to give a donation to Turning Point.